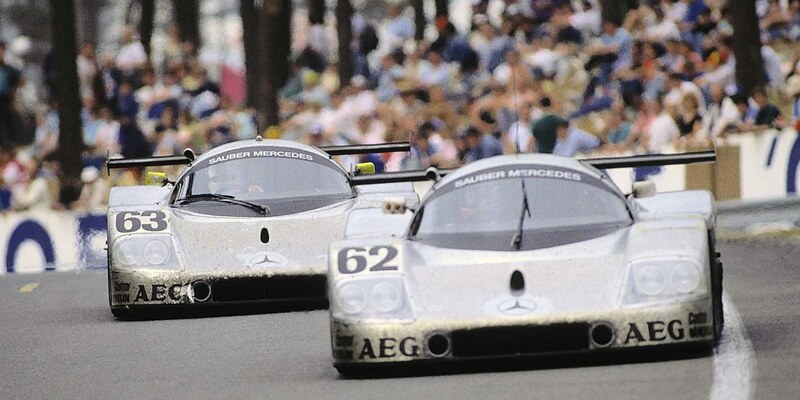 The double victory of the Sauber-Mercedes C 9 in the 24 Hours of Le Mans, on 11 June 1989, marked the culmination of the return of the Mercedes-Benz Silver Arrows to the race track. Jochen Mass, Manuel Reuter and Stanley Dickens won the race in the C 9 with the starting number 63, followed by Mauro Baldi, Kenny Acheson and Gianfranco Brancatelli (starting number 61). The triumph was completed by a fifth place for the third car racing for the Sauber-Mercedes team: the vehicle driven by Jean-Louis Schlesser, Jean-Pierre Jabouille and Alain Cudini, with starting number 62, achieved the best time during qualifying and started the race from pole position. The magazine “Motor Sport” paid tribute in its issue of July 1989 to the outstanding performance of the “third-generation Silver Arrows”. In so doing, the British magazine clearly emphasised the role of the C 9 in the history of motorsport at Mercedes-Benz: the Group C racing sports car developed by the Sauber team and powered by the 530 kW (720 hp) Mercedes-Benz M 119 HL engine was a worthy successor to the legendary Silver Arrows of the periods 1934 to 1939 and 1954 to 1955. During the 1989 season the C 9 became the rightful heir to the Silver Arrow name, joining the starting lineup with the classic silver paintwork of Mercedes-Benz racing cars. The C 9 deployed from 1987 until 1989 bore a variety of designs - and different names, according to the team’s sponsor. During the 1987 season it was known as the Kouros-Mercedes, then as the Sauber-Mercedes until 1989, and it finally started one race in 1990 as a Mercedes-Benz. The Sauber-Mercedes C 9 racing sports car was the outcome of a longstanding innovation partnership between Mercedes-Benz and the Swiss racing team established by Peter Sauber, a relationship that dated back to 1984. That was the year in which the Stuttgart company and the Zurich-based racing car designer reached an agreement for Mercedes-Benz to supply engines for the Sauber prototype sports cars used in the Group C motor racing series. The partnership marked the first step towards Mercedes-Benz’s return to international circuit motorsport since the company’s withdrawal in 1955. Sauber had already been competing in Group C racing since 1982, initially using Ford and BMW engines in its C 6 and C 7 sports car prototypes. Then in 1985, Sauber presented the C 8, powered by a Mercedes-Benz M 117 engine – a modified V8 based on series production with a displacement of 4973 cc. The C 8 promptly won the ADAC 1000 km race at Nürburgring in 1986. The following year saw Jean-Louis Schlesser win the Super-Sprint on the Nürburgring for Sauber-Mercedes in the new C 9 (still at that point powered by the M 117 engine from the C 8). From 1988 onwards, Mercedes-Benz again competed as an official works team in Group C for racing sports cars. The C 9 with an output of more than 515 kW (700 hp) also won the 800 kilometres of Jerez, the Czechoslovakian Grand Prix at Brno, the 1000-kilometre races at Nürburgring and at Spa-Francorchamps, and the 360-kilometre race at Sandown Park. On top of this came victories in the Supercup races on the Hockenheimring, Norisring and on the airfield at Diepholz. The ultimate prize came in 1989, when Sauber-Mercedes won the World Championship with the C 9. For the 1989 season the racing sports car was equipped with the new V8 biturbo M 119 engine with four-valve technology, which was able to develop short bursts of power up to around 680 kW (925 hp). The configuration used in the race, however, delivered an output of around 530 kW (720 hp). The cars had not only been technically improved; they were also now painted silver as a clear signal that Mercedes-Benz was back on the race circuit as a works team fighting for victories. Organisation, preparation and strategy all need to be as good as the car, if a team is to win the 24 Hours of Le Mans. That Sauber-Mercedes had what it took to win in the 1989 season was ably demonstrated by the Silver Arrows team even during qualification: Jean-Louis Schlesser and Jean-Pierre Jabouille took pole position with a lap time of 3:15.04 minutes, followed by Mauro Baldi, Kenny Acheson and Gianfranco Brancatelli in the second C 9 (3:15.67 minutes). However, the third vehicle with Jochen Mass, Manuel Reuter and Stanley Dickens joined the lineup in 11th position. Over the course of the race, however, this C 9 gradually made its way up through the ranks. “Impressive in the cool manner in which it had clawed its way back into contention from such a humbling beginning”, Ken Wells would subsequently write of this pursuit in his book “Mercedes Magic. The Story of the 1989 Le Mans Race”. For hour after hour they raced on through the night and the morning, the deep bass tones of their Mercedes-Benz V8 engines roaring away in concert. “In the cacophony that constantly bombarded the senses these three stood distinct above the rest in their tenor”, was how Wells reported this unique backdrop of sound. The power and reliability of the C 9, together with the smooth coordination between the drivers and the pit crew, was to pay off: at the end of this marathon race, two Silver Arrows would lead the field across the finishing line. The fastest car in qualification, however, had been beaten back to 5th place. This was most likely due to an accident during the second hour of the race, according to the race report in “Motor Sport”: Without this crash on the part of Alain Cudini, in which the car’s rear end had been damaged, Sauber-Mercedes might even have finished the race with a one-two-three victory. The new Silver Arrows won a total of 16 out of 18 races in 1989 and 1990. These included the 1989 win in the 24 Hours of Le Mans as well as victory in the 480-kilometre races at Suzuka, Jarama, Brands Hatch and Donington Park, in the ADAC Trophy on the Nürburgring, the Coupes de Spa in Spa-Francorchamps and the Trofeo Hermanos Rodriguez in Mexico. Jean Louis Schlesser won the Group C Drivers’ Championship in 1989, while Sauber-Mercedes took 155 points to become the winning team. 1990 saw the arrival on the racetrack of the Sauber-Mercedes C 11 as the successor to the C 9. This sports car prototype was the first Sauber car to feature a carbon-fibre chassis, which gave the vehicle outstanding strength. In 1990 Sauber-Mercedes once again took the World Championship drivers’ title (Schlesser and Baldi) as well as the constructors’ title. For the 1991 season, which brought the exclusion of turbocharged engines from Group C, Mercedes-Benz developed the new M291 V12 engine (478 kW/650 hp) for the C 291 racing sports car. This was the last Mercedes-Benz Group C car. The double victory in Le Mans in 1989 also represented a glorious link with history, for Mercedes-Benz had won the famous endurance race once before, in 1952, with its then new model, the 300 SL racing sports car (W 194). Back then it was Hermann Lang and Fritz Riess who crossed the finishing line as the winners, followed by Theo Helfrich and Helmut Niedermayr in the second W 194. The C 9 raced in the Sportscar World Championship between 1987 and 1989, as well as in the German Supercup series. This was the vehicle in which Sauber-Mercedes won the World Championship titles for both driver and team in both 1989 and 1990. The winning vehicle from Le Mans 1989 is fitted with the M 119 HL engine that was used in 1989 and 1990. In 2014 Mercedes-Benz is celebrating “120 years of motorsport” – for example at the Goodwood Festival of Speed (26 to 29 June 2014).